Wear your life jackets while under way. Abstain from alcohol consumption while boating. Thank you for keeping New Jersey's waterways safe! Recreational vessels are required to carry specified safety equipment which may vary according to type of propulsion, type of construction, area and time of use, and number of people aboard. Unless otherwise noted, all required equipment must be Coast Guard approved and must be kept in good, serviceable condition, be readily accessible, and be of the proper type and/or size. Recreational vessels may carry extra equipment that is not Coast Guard approved provided that the minimum requirements for approved equipment are satisfied. For equipment purposes, sailboats, canoes, rowboats, and inflatable rafts equipped with motors are considered to be "motorboats". Requirements vary considerably for commercial vessels and vessels engaged in racing. Personal Flotation Device: One Type I, II, III, or V Coast Guard approved personal flotation device must be carried for each person on board. They must be readily accessible and of an appropriate size for the intended wearer. Fire Extinguisher: One Type B-I Coast Guard approved fire extinguisher must be carried when no fixed fire extinguishing system is installed in machinery spaces. Extinguishers are not required for outboard motorboats less than 26 feet in length and of open construction. No portable extinguishers are required if an approved, fixed fire extinguishing system is installed in machinery spaces. Backfire Flame Arrestor: A Coast Guard approved backfire flame arrestor is required for inboard gasoline motors which are not exposed to the atmosphere above the level of the gunwale. Muffling System: An effective muffling system is required for the exhaust of each internal combustion engine. Unmodified outboards usually meet legal requirements. Sound Signaling Devices: A vessel of less than 39.4' (12 meters) must be able to provide a means of making an efficient sound signal but is not required to carry a whistle or bell. Visual Distress Signals (Coastal Waters Only): Boats less than 16 feet of completely open construction and not equipped with propulsion machinery, and boats competing in an organized marine parade, regatta, race, or similar event are only required between sunset and sunrise to carry aboard devices that are suitable for night use. Navigation Lights: Navigation lights must be kept in serviceable condition and displayed between sunset and sunrise and at times of restricted visibility. Personal Flotation Devices: One Type I, II, III, or V Coast Guard approved wearable personal flotation device must be carried for each person aboard. They must be readily accessible and of an appropriate size for the intended wearer. In addition, the vessel must carry an approved Type IV throwable device which should be immediately available. Fire Extinguisher: One Type B-I Coast Guard approved fire extinguisher must be carried when no fixed fire extinguishing system is installed in machinery spaces. Extinguishers are not required for outboard motorboats less than 26 feet in length and of open construction. No portable extinguishers are required if an approved fixed fire extinguishing system is installed in machinery spaces. Backfire Flame Arrestor: A Coast Guard approved backfire flame arrestor is required for inboard gasoline motors which are not exposed to the atmosphere above the level of the gunwale. Muffling System: An effective muffling system is required for the exhaust of each internal combustion engine. Unmodified outboards usually meet legal requirements. Visual Distress Signals (Coastal Waters Only): All boats 16 feet or more in length must carry devices aboard at all times. devices that can be used for both day and night use. Navigation Lights: Navigation lights must be kept in serviceable condition and be displayed between sunset and sunrise and at times of restricted visibility. Fire Extinguisher: Two Type B-I or one Type B-II Coast Guard approved fire extinguisher must be carried when no fixed fire extinguishing system is installed in machinery spaces. With a fixed system in the machinery space, one Type B-I fire extinguisher must be carried. Navigation Lights: Navigation lights must be kept in serviceable condition and be displayed between sunset and sunrise and at times of restricted visibility. For motorboats operating during these times. Fire Extinguisher: Three B-I or one B-I and one Type B-II Coast Guard approved fire extinguishers must be carried when no fixed fire extinguishing system is installed in machinery spaces. With a fixed system in the machinery space, two Type B-I or one Type B-II extinguisher must be carried. Muffling System: An effective muffling system is required for the exhaust of each internal combustion engine. Unmodified outboards usually meet legal. Sound Signaling Devices: Vessels 39.4' (12 meters) or more in length are required to carry a whistle and a bell. Personal Flotation Devices: Vessels less than 16 feet in length, and all canoes and kayaks, regardless of length, must carry one Type I, II, III, or V Coast Guard approved personal flotation device for each person on board. They must be readily accessible and of an appropriate size for the intended wearer. Vessels 16 feet and over, except canoes and kayaks, must have one Type I, II, III, or V Coast Guard-approved wearable device for each person aboard, plus at least one Type IV throwable device.The throwable device must be kept where it is immediately available. Wearable devices must be of an appropriate size for the intended wearer. Navigation Lights: All vessels are required to display navigation lights between sunset and sunrise and during times of restricted visibility. In inland and international waters, sailing vessels under sail alone shall exhibit navigation lights. The tri-colored lantern and the all-round green and red lights should never be used together. A sailing vessel of less than 23 feet (7 meters) in length shall, if practicable, exhibit those lights prescribed, or have ready at hand an electric torch or lighted lantern showing a white light which shall be exhibited in sufficient time to prevent collision. A vessel under oars may display those lights prescribed for sailing vessels or have ready at hand an electric torch or lighted lantern showing a white light which shall be exhibited in sufficient time to prevent collision. Sound Signaling Devices: A vessel of less than 39.4' (12 meters) is not required to carry a whistle or bell, but must be able to provide some other means of making an efficient sound signal. Except canoes and kayaks, all boats 16 feet or more in length: One wearable life jacket (Type I, II, III, or V) for each person on board and one throwable (Type IV) in each boat. Canoes and kayaks of any length and all other boats less than 16 feet in length: One I, II, III, or V PFD for each person on board. 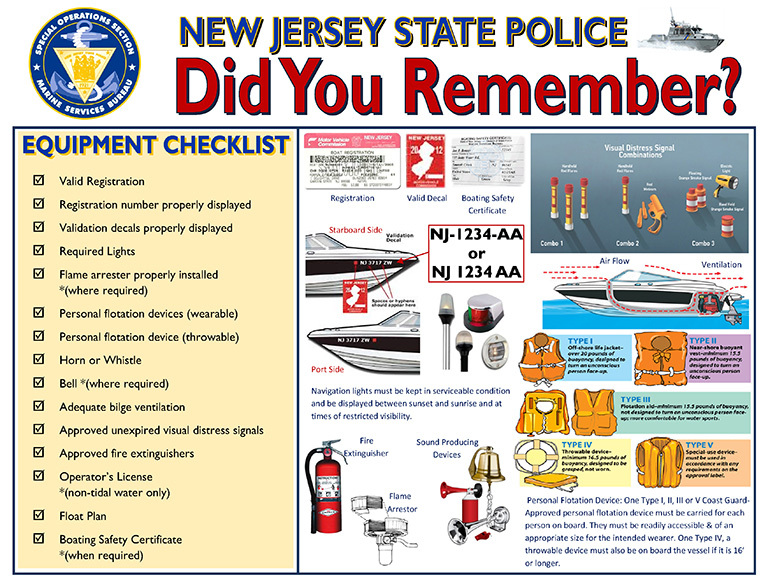 Under state law, it is an infraction, punishable by a fine of up to $250, to operate a vessel unless every child 12 years of age or younger on board is wearing a Type I, II, III, or V Coast Guard-approved personal flotation device (life jacket). the operator of a vessel on which every child under age 13 is in an enclosed cabin. Inflatable PFDs - The U.S. Coast Guard approved inflatable PFDs in 1996. Only certain brands are U.S. Coast Guard approved and some are only appropriate for adults. Proper use of inflatable PFDs, including appropriate age limits, vary by manufacturer. Please review the owner's manual and information pamphlet carefully before purchasing an inflatable PFD. While automatic inflation is not a required feature, inflatables must be equipped, at a minimum, with both manual (pull) and oral (blow) inflation systems. All motorboats or motor vessels, except open boats, made after 1940 and using gasoline as a fuel must have at least two ventilator ducts fitted with cowls or their equivalent for the efficient removal of explosive or flammable gases from the bilges of every engine and fuel tank compartment. If engine and fuel tank compartments are closed and separated, two such ventilation systems are required. There must be at least one exhaust duct installed so as to extend from the open atmosphere to the lower portion of the bilge and at least one intake duct installed so as to extend to a point at least midway to the bilge or at least below the level of the carburetor air intake. The cowls must be located and trimmed for maximum effectiveness so as to prevent displaced fumes from being recirculated. Boats built after April 25, 1940 that have a gasoline engine for electrical generation, mechanical power, or propulsion must be equipped with an operable ventilation system. A compartment containing a permanently installed gasoline engine must either be open to the atmosphere or ventilated by an exhaust blower system. The intake duct for an exhaust blower must be in the lower one-third of the compartment and above the normal level of accumulated bilge water. A combination of more than one exhaust blower may be used to meet specified requirements. Boats equipped with outboard motors or inboard motors, not enclosed and of "open" construction, are exempt from ventilation requirements. a flame-tight metallic carburetor air intake attachment, located or positioned so backfire flames would be dispersed to the atmosphere outside the vessel. This latter device must be acceptable to the Coast Guard and be such that the flames will not endanger the vessel, persons on board, or nearby vessels and structures. Federal law forbids dumping sewage, treated or untreated, or any waste derived from sewage, into the lakes, reservoirs, or fresh water impoundments of this state. Federal regulations and equipment standards established jointly by the Federal Environmental Protection Agency and the U.S. Coast Guard govern the use of marine sanitation devices (MSDs).State law prohibits dumping any human waste in a marina, yacht harbor, fresh water lake, or fresh water impoundment, from any vessel tied to any dock, slip, or wharf. A state or local peace officer who reasonably suspects that a vessel is discharging sewage in an area where the discharge is prohibited may board that vessel, if the owner or operator is aboard, for the purpose of inspecting the marine sanitation device for proper operation and placing a dye tablet in the holding tank. Federal law requires all boats 26 feet or longer to display an Oily Waste Discharge Placard in the engine compartment or near the fuel tank. 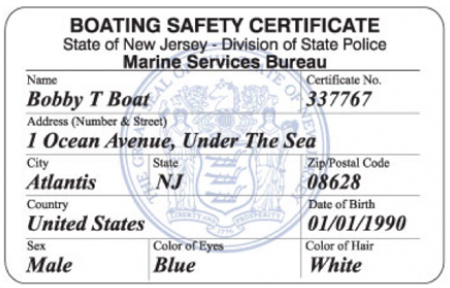 For more information, call the U.S. Coast Guard toll-free boating safety information line, (800) 368-5647.
plastic, paper, rags, glass, metal, crockery, dunnage, or food in U.S. lakes, rivers, bays, sounds, and up to 3 miles from shore. any plastic, or any of the above items if not ground to less than an inch in size, between 3 and 12 miles from shore. plastic or dunnage 12 to 25 miles from shore. plastic outside 25 miles from shore. The required placard details these prohibitions. The placard must be displayed in a prominent location where the crew and passengers can read it, must be at least 9 inches wide by 4 inches high, and must be made of durable material bearing letters at least 1/8 inch high. All U.S. vessels 40 feet or more in length and equipped with a galley and berthing must, in addition, carry a Waste Management Plan, if the vessel operates beyond 3 miles from shore. The Waste Management Plan must be in writing, must designate the person who is in charge of carrying out the plan, and must describe procedures for collecting, processing, storing and properly disposing of garbage in keeping with the prohibitions described above. Operating a boat at night without lights is not only dangerous, it is against the law. Running lights make it possible for boat operators to properly interpret and react to the movements of other boats in darkness. If a boat is used exclusively in the daylight hours, and not during periods of restricted visibility, running lights are not required. All vessels must show required running lights between sunset and sunrise and during periods of restricted visibility. Light requirements vary, based on vessel length and propulsion type. In most cases, requirements for a particular vessel are the same under both inland and international rules. Power-Driven Vessels: A recreational powerboat under way is required to display a masthead light forward, red and green sidelights and a sternlight, a recreational powerboat under 39.4' (12 meters) may instead display a 360 all-round white and combination red and green sidelights.